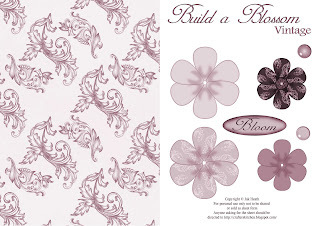 As requested I've made another four sheets of the Build a Blossom, Vintage, Dusky Pink, Golden Yellow, Sage green and Lavender. I've added them on my design page just click the sheet below and it will take you to them. Oh Jak, you are an angel, love the new sheets too, especially the Sage Green. Gorgeous!! Thank You so much. What do you make beautiful creations! You are spoiling us Jak, thanks for more fab freebies and in beautiful colours. Thanks for more beautiful sheets Jak,the colours are fab. Beautiful as always. Thanks so much for sharing!! Lana C.
I have used so many of your wonderful sheets and just love them. Thank you for being so generous with your talent. These are simply gorgeous! Love the colours. Thanks for sharing them with us Jak, you are such a talented lady! I love the sweet paper! Thank you for sharing it.